Over spring break, Berklee students attended industry trips to L.A., Nashville, New York City, and Atlanta. Here, a participant in the Atlanta trip, Claire Marie Lim, recounts the week’s experience. 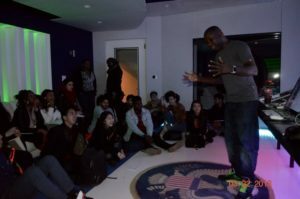 Only a few days into spring break, Atlanta welcomed twenty Berklee students on their maiden voyage into Georgia’s capital city. We were excited to be led by our professors, Atlanta veterans Prince Charles Alexander and Jason Stokes, and our Career Center advisor Jessie Yeh, to experience the Big Peach. It is no surprise that Atlanta is nicknamed the “Headquarters of Hip-Hop” given its roster of artists from the genre, including the Ying Yang Twins, Outkast, Gucci Mane, and Quavo of Migos. The rise of hip-hop was impressed upon us as we visited several music facilities and interacted with their owners, managers, and assistants who were immersed in the scene. A major highlight of our tours was a visit to Grammy-winning mix engineer Leslie Brathwaite’s studio. Having worked with the likes of Pharrell, Ciara, Rick Ross, and Cardi B, Leslie shared invaluable insights into hip-hop and its place within American music culture, and gave us heartfelt advice about pursuing a career in the industry. His words were echoed by many of the music practitioners we met, who encouraged us to persevere, but reminded us that we would need resilience and hard work on the path leading to musical lives. 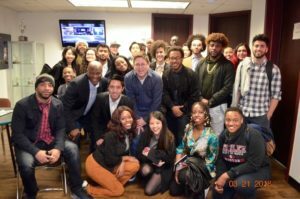 Keeping in mind the notion of music being a business, we were hosted by Lee & Hayes law firm for a series of workshops pertaining to American music laws. With years of experience advising artistic clients, attorney Robert Madayag prepared us for a deep dive into key topics such as copyright, royalties, and contract negotiation, the last of which saw us practice negotiating with each other first-hand. If it hadn’t been clear before, we walked away knowing the importance of being informed professionals, especially having valuable musical products to offer. The evening before our journey back to Boston, we were kindly invited to sit in on a full studio session at Patchwerk Recording Studios, facilitated by mix engineer and Berklee alum Miles Walker. It was fascinating to watch and listen to how a production team worked together so efficiently, from beatmakers Zak Menebhi and Will Lovely, to topliner-vocalist Jay Harris, to engineer jumper and his assistant Luke Campolieta, also a Berklee alumnus. The creativity that united everyone in the room surely manifested in the fully produced song they had made by the end of the night. 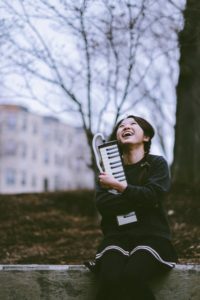 As aptly put by one of the professionals we encountered, “Elsewhere, people try to cut your strings; in Atlanta, people give you ropes.” The sense of community that we felt from Atlanta’s music scene was impossible to deny, even from a mere few days of being in the city. All of us on the Atlanta trip were incredibly blessed to have been on this journey, and we couldn’t have asked for a more eye-opening time spent together in the Hollywood of the South.